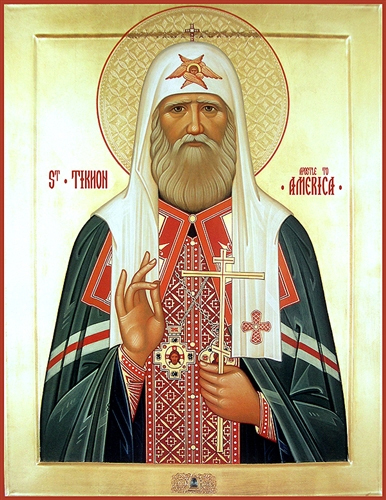 St. Tikhon (Тихон Московский) was a Patriarch of Russia, Confessor, and Ecumenist. A Russian Orthodox Priest, he was assigned to work in America in 1898. He participated in many ecumenical events with other denominations, particularly the Episcopal Church. He was held in such esteem that he was made an honorary citizen of the United States. Tikhon later established warm relations with the Diocese of California. He returned to Russia in 1907, and died there in 1925. The Cathedral will celebrate this little-known saint with a Choral Evensong on April 7 at 5:30 pm, with the Cathedral Choir and Choral Scholars. Music will feature chants, hymns, and other works from the Russian Orthodox tradition. Highlights include a setting for Phos hilaron (O gladsome light) by I. Dvoretsky, Magnificat and Nunc Dimittis using Znamenny Chant, a singing tradition used in the Russian Orthodox Church. The anthem will be The Beatitudes, a Russian Orthodox hymn arranged by R. Proulx. The service will conclude with an organ setting of the Russian National Hymn by W. Eugene Thayer.